Tofu is one of the healthiest and cleanest sources of proteins that owes its origin to the Han Dynasty in China about 2000 years ago. 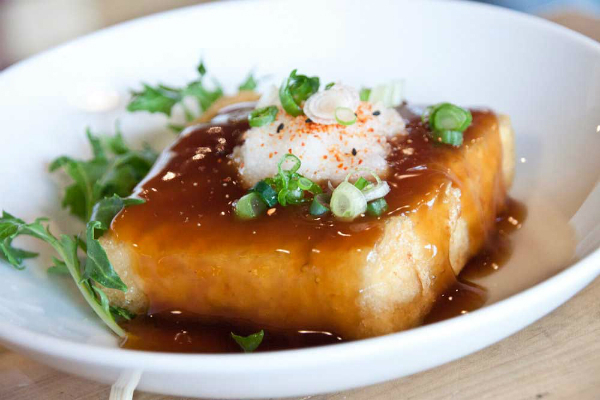 While the long standing deep oriental roots of tofu is a reason good enough to try it out, the health benefits of this one of a kind food overtakes every other reason to make it an essential input in your meals. Being made of curdled soy milk, tofu is free of certain ingredients that are known for causing health hazards like gluten and bad cholesterol. At the same time, tofu is also low in the much dreaded ‘calories’ making it perfect for weight watchers. Besides this, tofu has also been linked directly with minimizing the risk of cancer (especially prostate cancer and breast cancer) by boosting the antioxidant levels in the body. Women going through menopause are also amply benefited by tofu, which functions to reduce hot flashes in the body while offering an explosion of calcium which tends to get depleted during this phase. And here is the icing on the cake… certain active ingredients in tofu helps in slowing down and often reversing the process of aging, helping you ward off the wrinkles for longer! Tofu scramble can be hot favorite in your breakfast platter. You can add kale, red pepper, mushrooms. When thinking of adding more veggies, sauté the veggies first or broth so that the taste gets elevated. It can be the ideal choice for a hearty vegan breakfast. If you want to relish a sweet and sour taste and go the soupy way, you can add some crunchy vegetables, boiled soft noodles along with tofu and whip up a mouthwatering tofu noodle soup. For simple stir fried tofu, you will need a bowlful of tofu cut into blocks as per the size you desire; 3 tablespoons of vegetable oil; 1 large onion diced; few garlic cloves diced; 1 red chilli slit into half; 2 tea spoons of black pepper; 1 bowlful of mushrooms; diced vegetables of your choice (preferably broccoli); 3 tablespoons of chicken stalk and 3 table spoons of oyster sauce and salt to taste. Firstly, you need to fry the tofu to golden brown in a heated and vegetable oil coated wok and remove it into a plate. Now heat some more oil in the wok and add the garlic, onion and chilli till the garlic begins to exude aroma. Add in the mushrooms and stir fry again till it is cooked. Now add the vegetables and cook till they are tender. Now add the fried tofu to the wok followed by chicken stalk and oyster sauce. Cook for about a minute before pulling it out of the flame. Serve hot with steamed rice for a complete meal. This is perhaps the easiest salad recipe that you could fix in your kitchen without calling for any excellence whatsoever in cooking skills. The ingredients of this salad include 2 cups of mesclun (an assortment of young tender salad leaves); 1 tablespoon of fresh cilantro / coriander leaves; 1/3rd cup mushrooms of your choice; 1/3rd cup grated carrots; ¼ cup diced radish; 1 small avocado diced; dressing of your choice and most importantly, 1 cup diced tofu (preferably firm). The procedure is just as simple as putting all the ingredients together and mixing well for a delicious, healthy and low calorie food option. To make your salad a little more interesting, you can grill the tofu with seasoning of your choice or even stir fry it in light vegetable oil.